These pics really rock!! real stunners!!! 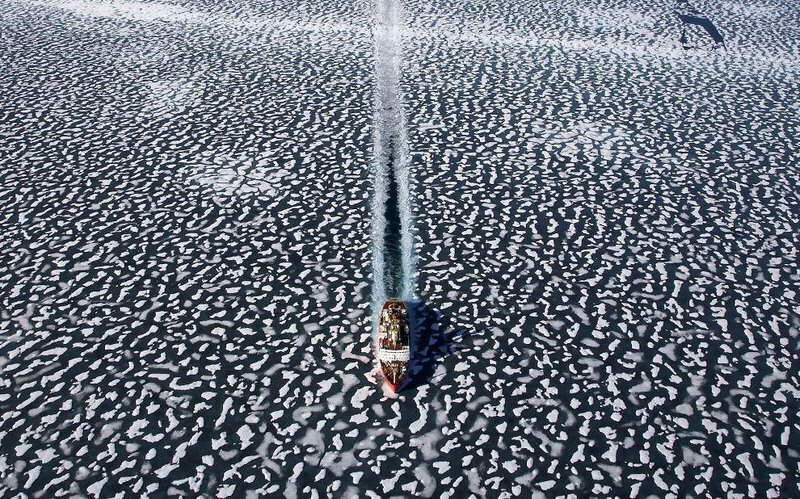 Icebreaker Louis Saint Laurent in Resolute Bay, Nunavut Territory , Canada . 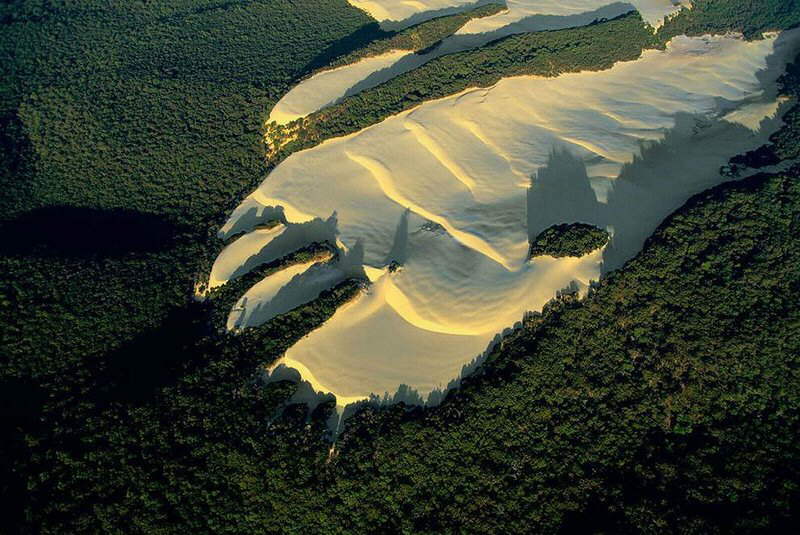 Sand dune in the heart of vegetation on Fraser island, Queensland , Australia . Fraser Island, named after Eliza Fraser, who was shipwrecked on the island in 1836, is the world's largest sand island. 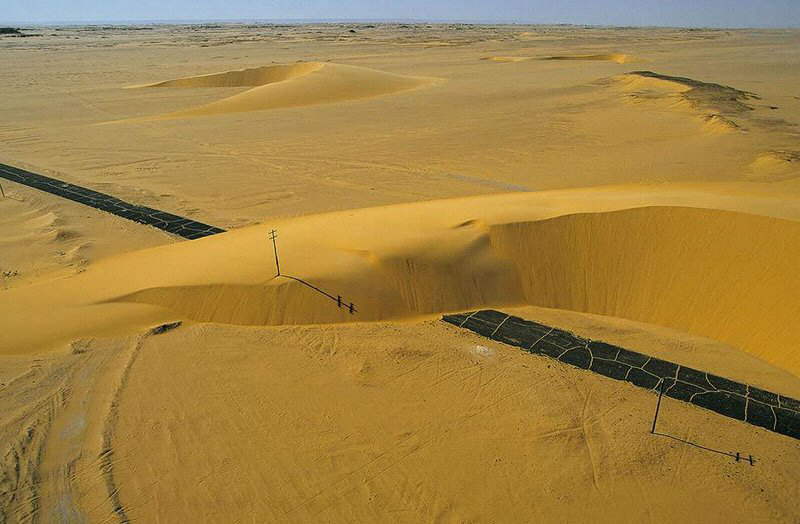 On top of this rather infertile substratum, a humid tropical forest has developed in the midst of which wide dunes intrude, moving with the wind. Fraser Island has important water resources, including nearly 200 freshwater dune lakes, and has varied fauna such as marsupials, birds, and reptiles. Welcoming 200,000 visitors a year without damaging the local fauna and flora is a real challenge to sustainable development on the island, which was declared a World Heritage site by Unesco in 1992. 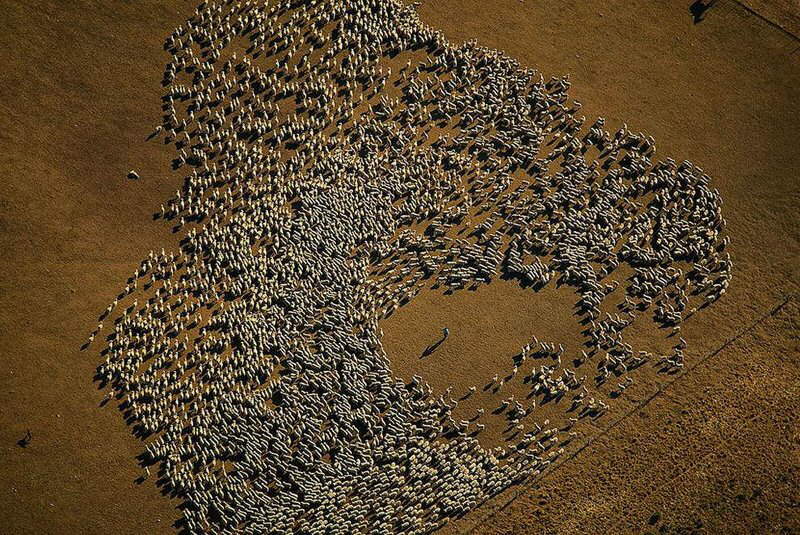 Flock of sheep, Tierra del Fuego , Argentina . After the missionary period, between gold fever and the first drillings for oil, sheep-raising became the chief activity in the north of the main island, Isla Grande de Tierra del Fuego. The local cabanas (sheep pastures) are huge sheep farms with 3.5 acres of land per head of livestock. 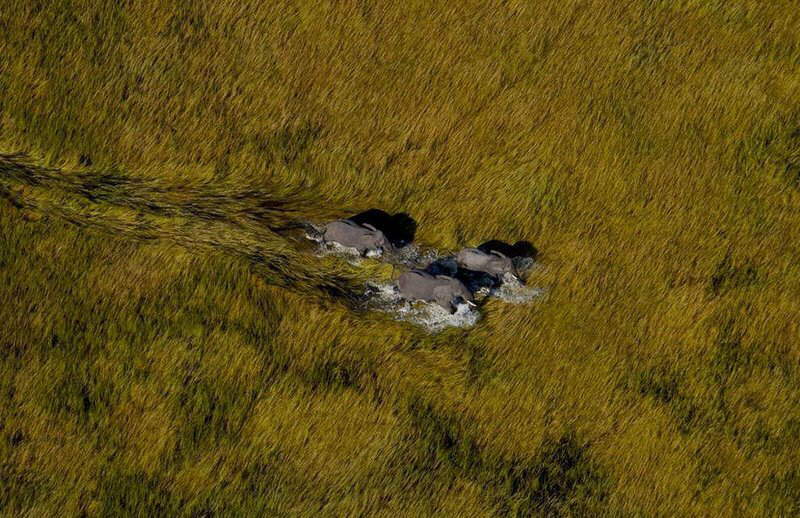 Elephants in the Okavango Delta , Botswana . The Okavango Delta is the world's largest inland delta, flooding seasonally, and is populated by five ethnic groups of people, sharing it with hundreds of species of animals. Iraqi tank graveyard in the desert near Al Jahrah, Kuwait . 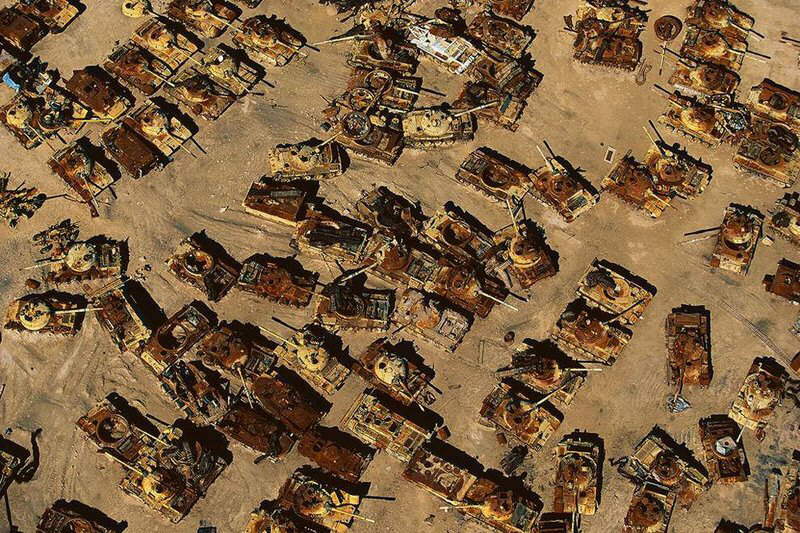 This graveyard of tanks will bear witness for many years to the damage that war causes both to the environment and to human health. In 1991, during the first Gulf War, a million depleted uranium shells were fired at Iraqi forces, spreading toxic, radioactive dust for miles around. Such dust is known to have lasting effects on the environment and to cause various forms of cancer and other serious illnesses among humans. Village in the Rheris Valley , Er Rachidia region, High Atlas Mountains, Morocco . Fortified villages are frequently seen along the valley of the Rheris, as they are on most rivers of southern Morocco , inspired by the Berber architecture built to protect against invaders. 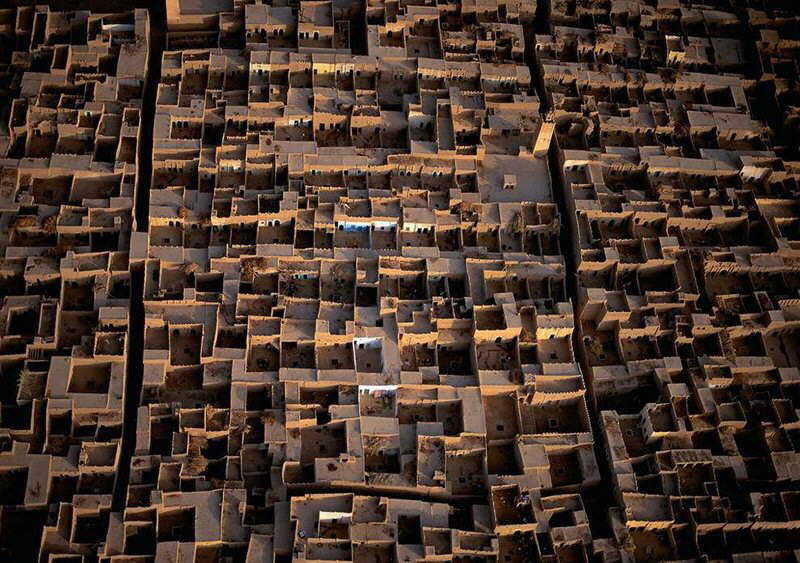 Today, with the threat of raids now gone, the close clustering of dwellings, small windows, and roofs covering houses and narrow streets serve the purpose of protecting occupants from heat and dust. The flat, connecting roofs also provide a place for drying crops. The Athabasca Oil Sands, Alberta , Canada . 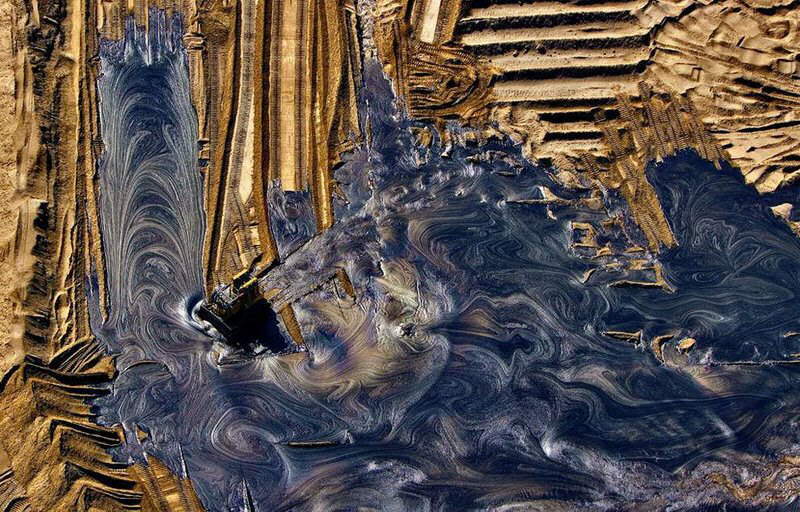 These oil deposits make up the largest reservoir of crude bitumen in the world, and as recently as 2006, produced over 1 million barrels of crude oil per day. 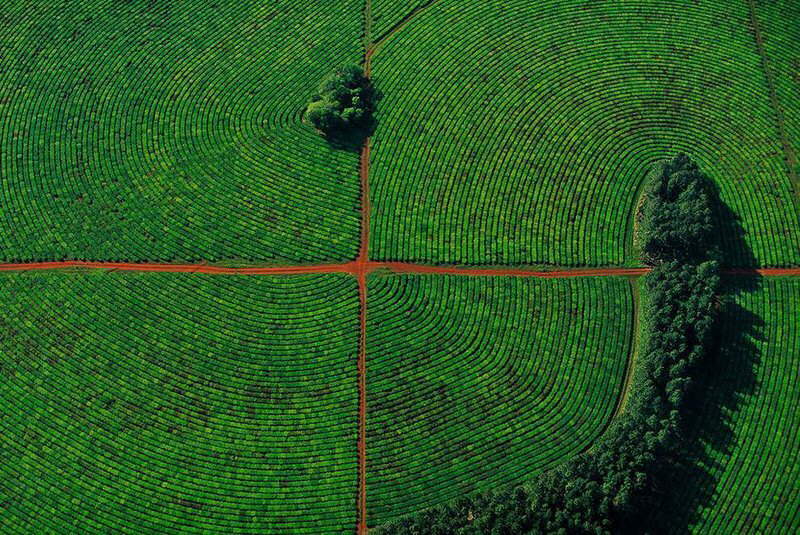 Tea cultivation in Corrientes province, Argentina . The fertility of the red soil and the regular rains of the Corrientes region create the ideal conditions for the cultivation of tea. In an effort to protect the soil against erosion, tea is planted along curved terraces and protected from the wind by hedges. Unlike Asian and African countries, where the young sprouts are handpicked, in Argentina mechanical harvesting is the rule, done mainly with high-clearance tractors that are driven along the straight rows of tea bushes. Icebergs and an Adelie penguin, Adelie Land, Antarctica . Antarctica, the sixth continent, is a unique observation point for atmospheric and climatic phenomena; its ancient ice, which trapped air when it was formed, contains evidence of the Earth's climate as it has changed and developed over the past millions of years. American cemetery north of Verdun, Meuse, France . Covering some 40 hectares (100 acres) at Romagne-sous-Montfaucon, 40 kilometers (25 miles) from Verdun , the American cemetery was dedicated in 1935 by the American Battle Monuments Commission. The commission was created in 1923 at the request of General Pershing, who had taken part in the American offensive of 1918. Its aim was to undertake architectural and landscape studies in order to restructure American cemeteries and commemorative monuments in Europe . 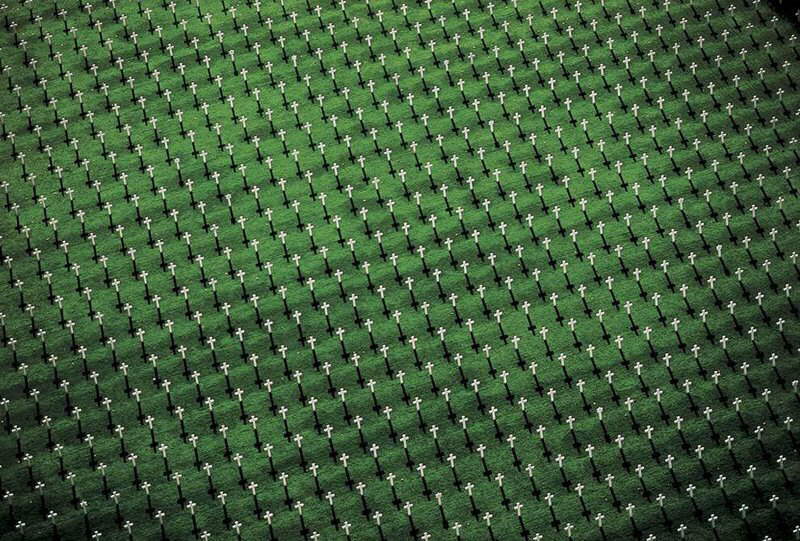 Whereas the French army chose to build permanent cemeteries where temporary cemeteries had been made during the hostilities, the American army opted to create a single cemetery. Some 25,000 American tombs scattered around Verdun were then brought together at Romagne where, after almost half the bodies were repatriated to American soil, 14,246 soldiers have lain ever since. Islet in the Sulu Archipelago , Philippines . 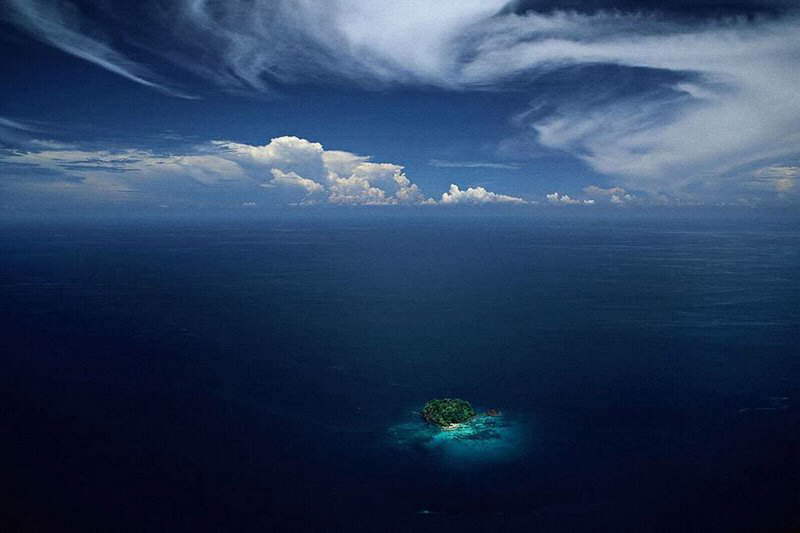 More than 6,000 of the 7,100 Philippine Islands are uninhabited, like this islet in the Sulu Archipelago, a set of 500 islands that separate the Celebes and the Sulu seas. Their extraordinary biodiversity is under threat, not from distant industrial sites but from the effects of global pollution. 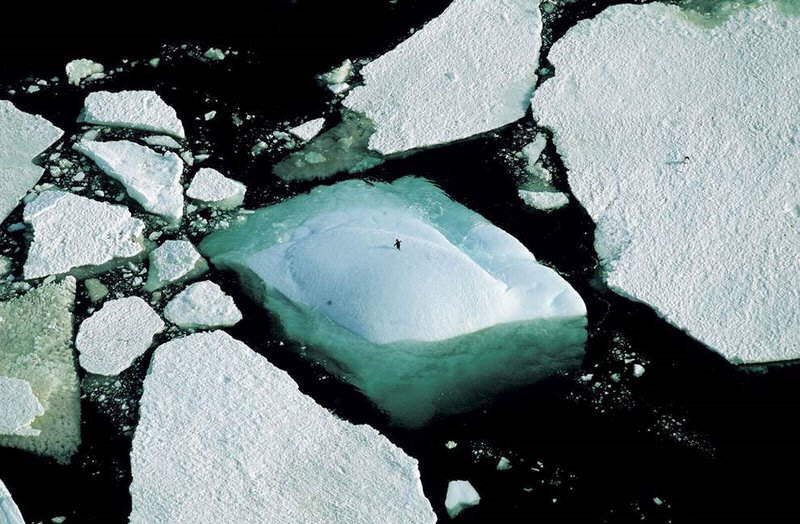 These islands, which barely rise above the surface of the water, are among the first potential victims of global warming and are certain to disappear when the sea level rises. "Dreams are not what you see when you sleep; dreams are what keep you from sleeping." There, I fixed it grammatically. It's still not a very good saying, though. No they are not, and you spelled they're incorrectly. Thanks Wadada for the info on the photo source. 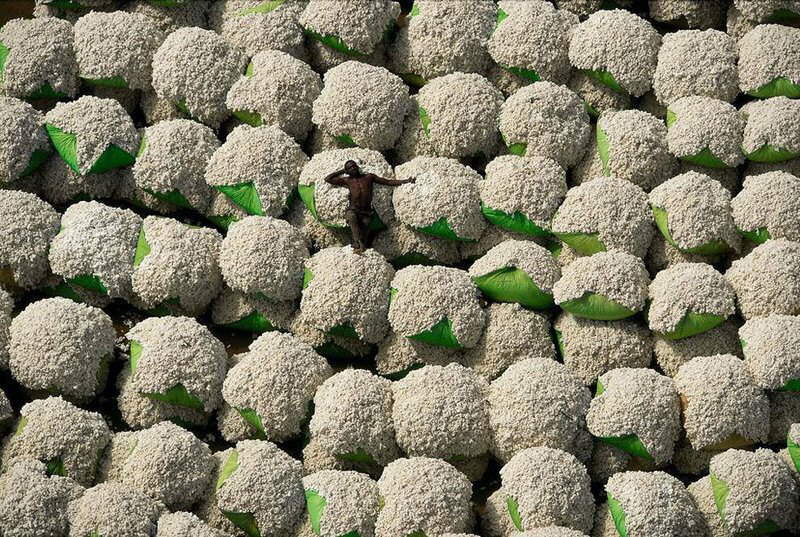 Did anyone else think the second picture down looked like a guy lying on cauliflower? I thought "shopped" before I read the description. In 1991, during the first Gulf War, a million depleted uranium shells were fired at Iraqi forces, spreading toxic, radioactive dust for miles around. Who's your research editor? Fire him/her. The sea is NOT rising due to global warming or any other nonsense. If it were true then these islands would already be gone. Who cares where the pictures came from? They are beautiful. Are they photoshopped? Who gives a flying whatever! Life is short then you die. Enjoy beauty without bla bla bla'ing about it. 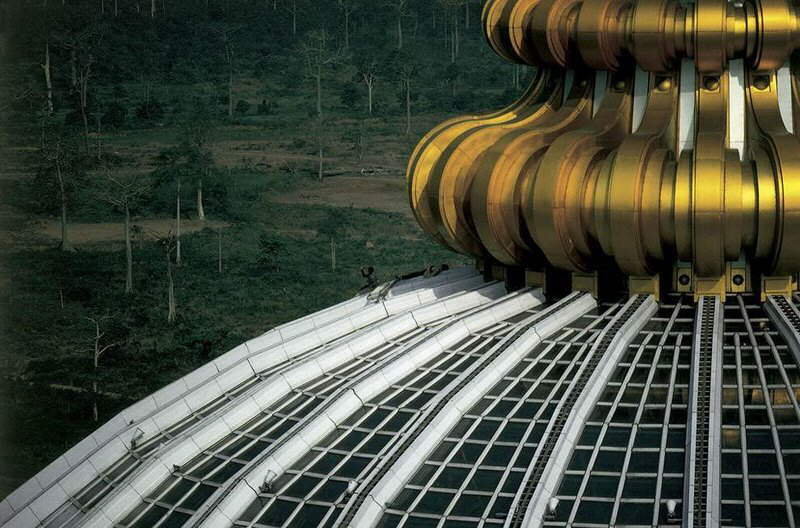 The photos are taken from the books of Yann Arthus-Bertrand (named '365 days, the earth from the sky', first published Paris, 2001) which also include these comments, which are edited by Hervé Le Bras, director of demographical studies in the Institut National d'Études Démographiques and specialist on social and demographical history. 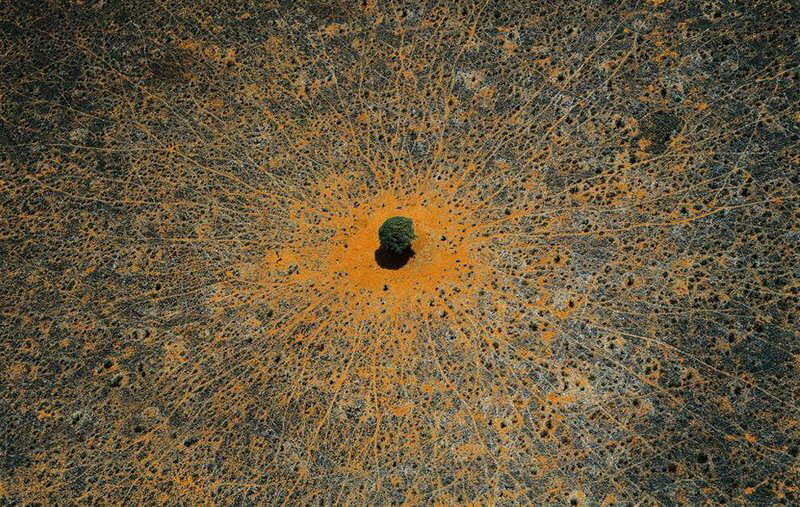 And they aren't manipulated by photoshop techniques, the earth really shows these beautiful patterns when seen from the sky.. Accept beauty (and Love) where you find it! "Dreams are not the actors of your slumber, on the contrary they are what might refrain you from falling asleep"
Beautiful, dreamlike images wafting through a beautiful, dreamlike world. "Photoshopped!" is the pejorative of the non-photographer, the one without the talent to do what the photographer has done. It's the same with every art, those who can, do, those who can't, criticize. ONE MILLION tank shells fired in 1991 Gulf War? !!! Do the math. Impossible. There were about 3000 coalition tanks. Each and every one would have to fire over 300 rounds. The entire ground armored war lasted only about 3 days. That's 100 rounds per day. Looking at it from the Iraqi perspective. They had about 2000 tanks. Even if every single one was destroyed (not true) it means that there was 500 rounds fired per target. I'm sure the depleted Uranium caused many health problems, but don't exaggerate. Global warming has been debunked! The only people who are still promoting it are the ones who WANT there to be global warming so that they can blame it on big, bad capitalism and so use it as an excuse to force socialism down our throats. The pictures themselves are beautiful. Whoever posted them should simply have told us their origin and kept the political commentary to him or herself. There is a possible explanation to the "1 million shells" debate. If one considers ALL the weapons that use depleted uranium, it becomes quite possible. The gatling gun in the A-10 fires at a rate of 3,900 rounds per minute. At that rate, the A-10's alone would fire a million rounds in a little over four hours of continuous fire. Add the tanks and other weapons using depleted uranium, and now it looks quite reasonable. I'm from the Philippines and I've never seen the Island of Sulu as beautiful as that. Great post! since the dawn of photo manipulating and comments on web pages, people have learnt a magical mystical word to annoy the hell out of everyone else: PHOTOSHOPPED. These are great photos... photoshopped or not... and even if they are, there would always be an original to start with.. these were not invented. If they are originals..they are breathtakingly awesome.....photoshopped... they are breathtakingly awesomely enhanced. To Graham who posted on December 26th: You're an idiot. To "mizdemeanor" right above me: I like your play on words and completely agree! Great photos! Wonderful shots. I'm really amazed on how beautiful earth really is..
What infuriates me about people blithely throwing the word "photoshopped" around is how insulting it is to the photographer, whose skill and talent went into getting the shot. It is belittling. These photos are stunning. KeeRIST! This garbage is from your blog and YOU'RE saying "bad pics"? It's just laughable! How shallow and insulting to humanity! Your photos are excellent, and the colours are awesome.